On Wednesday, graphic footage of Alton Sterling being shot and killed surfaced, showing that police had previously subdued Sterling before shooting him. The next day, Philando Castille was killed by a police officer while reaching for his wallet. Officers claim both Sterling and Castille had a gun, Castile was licensed to carry and Louisiana, where Sterling was shot, is an open carry state. Both Sterling and Castille were black men. Police violence in the United States is endemic. An investigation by the Salt Lake Tribune in Utah finds that more residents in the state were killed by police than gang members or drug dealers. Between Jan. 1 and May 3 of 2015, 1 in 13 of the gun killings in the U.S. were committed by police. However, it does not fall equally across racial groups. According to the Guardian, people of color make up 38 percent of the population, but 47 percent of those killed by police. People of color make up 63 percent of those who are unarmed when killed by police. Using the American National Election Studies 2016 (ANES 2016) survey, which includes a battery of questions on police violence, I find that racial resentment strongly predicts attitudes about police conduct. I also find differences across party lines, race and support for major presidential nominees. To explore attitudes about police violence, I use the ANES 2016 survey, which I’ve discussed in more detail here. ANES 2016 asks respondents, “In general, do the police treat whites better than blacks, treat blacks better than whites, or treat them both the same?” Among all respondents, 37% answer “the same” (2% say black people are treated better, 60% say whites are). Among white respondents, 42% say police treat whites and blacks equally, compared with a mere 19% of Black respondents (and a quarter of Latino respondents). There were large partisan differences as well: less than a fifth of Clinton supporters say police treat black people and people equally, compared to more than half of Trump supporters (53%). Using a model created in collaboration with San Francisco State political scientist Jason McDaniel, I explore the effects of racial resentment on attitudes towards police behavior (see here for a discussion of racial resentment). In a model that controls for party identification, ideology, family income, education, age and gender, racial resentment strongly predicts white attitudes towards police violence. The charts below show that as resentment increases, respondents are less likely to say that whites are treated better by the police, more likely to say that police treat both white and black people the same. Very few respondents say the police treat black people better than white people, but those what do have a mean score on the racial resentment scale of .78 (on a scale from 0 to 1). The mean score for those who say police treat whites better is .52. ANES 2016 also includes a feeling thermometer which asks respondents to place different groups on a thermometer from 1 (coldest) to 100 (warmest). The average placement of the police on the thermometer was 67. Among whites, the average placement was 71, among black people, 52, among Latinos, 65. Racial resentment also strongly affects feelings towards police. Among whites with the lowest resentment, the predicted thermometer score for police is 59. Among whites with the most resentment, it’s 76 (the mean score for Trump supporters is 74). The survey also asks "How often do you think police officers use more force than is necessary under the circumstances when dealing with black people?" The same question is asked regarding white people. Half of respondents say police officers are equally likely to use force more often when dealing with black and white people (47% say police are more likely to use force on black people, and 3% on whites). Among white respondents, 57% said use of force was equal, compared with only 16% of black respondents (and 42% of Latino respondents). Sixty-eight percent of Trump supporters say police treat both races equally, compared with 34% of Clinton supporters. Another question asks, “How often do to think police officers stop black people on the street without a good reason?” (the same question is asked about whites). Racial resentment has a strong effect on both questions. Whites with the lowest level of racial resentment are more likely to say police use force more than necessary against black people and stop black people without good reason. 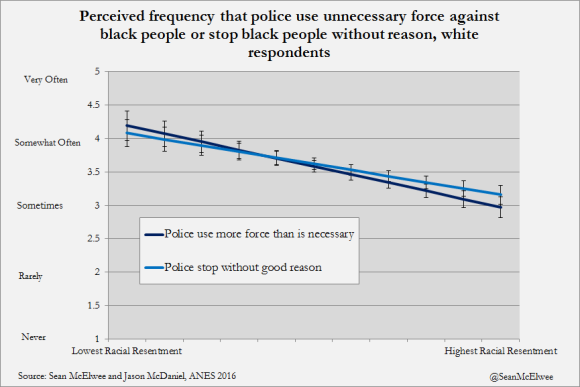 The chart below shows predicted views on how frequently police use unnecessary force against black people or stop black people without reason, controlling for the same variables in the model above. However, the data tell an unambiguous story about racial biases in police force. The Guardian finds that, “Young black men were nine times more likely than other Americans to be killed by police officers in 2015.” So far his year, the Guardian counts 558 people have been killed, disproportionately Native American people and black people. African-Americans make up 13% of the population but 25% of those killed by police (my calculations from the Guardian data). There are also discrepancies when the victim is unarmed. The Washington Post reports that, "black men were seven times more likely than white men to die by police gunfire while unarmed." In a country that has identified black people as its criminal element, public safety (and perceived security) is more tied to the suppression of blacks than it is to the suppression of crime. And as long as the public insists on its myth of black criminality—almost as an article of faith—police practices will be impossible to reform. The stereotype of black violence is disturbingly common among Americans, particularly white Americans. ANES asks respondents how well the word “violent” describes both black and white people. Options range from “extremely well,” to “not at all” on a five-point scale. I find that 40 percent of whites Americans rate black people as more violent than whites. 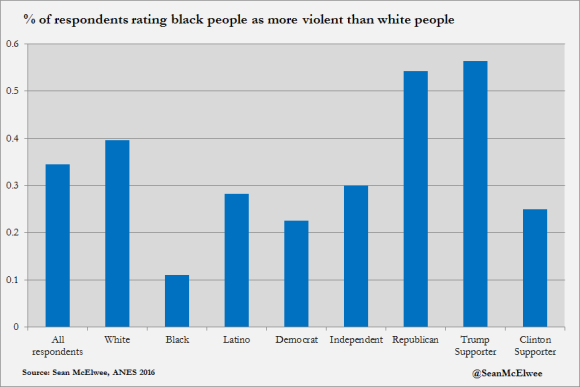 Twenty-seven percent of white Democrats, 55 percent of white Republicans and 60 percent of white Trump supporters say black people are more violent than whites (the chart below shows the percent of respondents rating black people as more violent than white people). While 26 percent of whites say the word “violent” describes black people “extremely” or “very well,” only 7 percent say the same about white people. Among whites who believe that the word “violent” describes black people “extremely well,” 41% say the police favor whites and 50% say treatment is equal. Among whites who say the word “violent” describes black people “not at all” well, 66% say police favor whites and 33% say treatment is equal. “Does he have a history of violence?” Cameron asked. “He was like a gentle giant,” Sandra Sterling replied. “Can you tell us what his previous incident with the law was?” the CNN host pressed. When a subdued black man is killed by police, focusing on the victim’s “history of violence” is indicative of the attitudes that make police violence so disturbingly frequent. YouGov finds widespread support for many popular proposals. Fully 88 percent of Americans support body cameras and 74 percent support an outside investigation. However, body cameras can be covered up and there is some evidence they don’t succeed in reducing police violence if police officers can turn them off (there is also evidence they work). Training police in de-escalation techniques and reducing access to military-grade weapons could also reduce violence. In addition, community-based policing, like that embraced by the Dallas Police Department offers hope. Samuel Sinyangwe, a policy analyst at Campaign Zero tweets, “Of 4,054 people killed by police since 2013, only 6 cases have led to convictions of officers involved.” Independent investigations and federal oversight could reduce the incidence of officers being cleared of wrongdoing by prosecutors that frequently work with them. But, as Ramsey notes, there are far deeper questions that need to be addressed. YouGov polling finds that 49 percent of the public view the Michael Brown shooting as an isolated incident (37 percent see it as part of a broader pattern). Among white Americans, 56 percent view it as an isolated incident (31 percent as a broader problem). Among black Americans only 22 percent view it as an isolated incident, while 68 percent see it as part of a broader problem. Americans must recognize the structural and historical nature of police violence. The attitudes that black bodies as disposable and black people are criminal are a central component of America’s police violence problem and a barrier to reform. The author would like to thank Jason McDaniel for insights on the models in this piece.